Wolff grew up in a house on concrete stilts, fifteen feet above a cypress swamp, swimming in a lake speckled with alligator heads, singing with countless bullfrogs. He absorbed the splendor of nature’s art, learning to paint before he learned to walk. As a child, he painted skeletons on bicycles, women with wings and a strange collection of forest beings he called The Winterlings. After his childhood home burned down in a blaze so intense that it left an iron claw-footed tub twisted like a human ear, Wolff moved to Sarasota where he studied by day and painted by night, earning a bachelor’s degree in Natural Science from New College of Florida. His studies in organic chemistry inspired him to create a highly-textured paint surface reminiscent of the swampscape of his childhood. He paints with oil, acrylics, and mineral pigments. 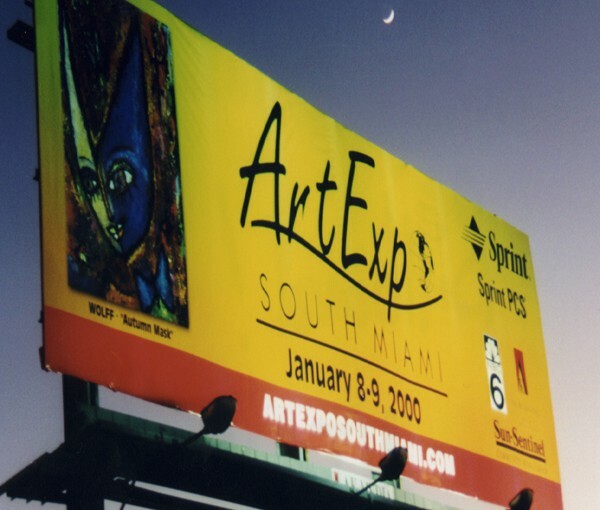 In 2000, ARTEXPO SOUTH MIAMI named Wolff Artist of the Millennium. This honor placed his painting “Autumn Mask” at the forefront of a two million dollar advertising campaign which included billboards across South Florida. At the ARTEXPO show, Wolff sold his first painting to baseball legend Andre Dawson for $5000. He bought a cargo van and roamed the country meeting gallery owners and selling art. Wolff’s artwork hangs in the private collections of Pulitzer Prizewinning Author Frank McCourt (Angela’s Ashes), Psychiatrist Keith Ablow, Astronomical Engineer Richard Kupczyk (NASA’s Apollo Missions), and Poet Laureate Billy Collins. His art has been purchased by executives at Starbucks and Amazon. He has sold almost a thousand pieces through shows and galleries and has exhibited at many prestigious events, including ARTEXPO NEW YORK in Manhattan. Wolff’s written works have been acclaimed almost as much as his paintings. He has published in dozens of literary anthologies and earned praise from former Poet Laureates Robert Pinsky and Mark Strand. Wolff has published two books of poetry “Orphanage of Imagination” (2002) & “Heavyweight Champion of the Night” (2008). Wolff’s poem “Into The Day of Saturn” was quoted in a horoscope by renowned astrologer Rob Brezsny. In addition to visual art, Wolff co-founded the Americana band, The Winterlings, channeling his poetic and painterly energy into original songs. The Winterlings have recorded 4 studio albums, played in Seattle’s great listening rooms and earned praise from PASTE, No Depression, The Seattle Times & BBC Radio which said, “We are impressed!” Their first album, The Animal Groom (2010), hit #6 on the Folk Chart. Over the past 7 years they’ve played in thousands of venues and opened a show for Blue Oyster Cult. In 2017, they played at the Lincoln Memorial for the Restore Civility Peace Rally in Washington D.C. C-Span broadcast the event to 9 million people. Painting professionally for nearly two decades, Wolff continues to explore a vivid, personal mythology which blends language, form and texture. His unique vision continues to inspire his collectors, who hang his paintings not just as design centerpieces, but as portals into mystery. Please visit Winterlings.com to learn more about Wolff’s musical creations. Wolff currently lives and creates in Seattle, Washington.